SPF Release® makes cleanup easy on your guns and safety equipment. Rinse off with soap and water. 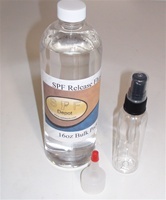 For Air Shipment overseas - Order SPF Release® FLUID. I haven’t received the product yet. But I have used this product before, and I think it is amazing! It makes my equipment run better, with less downtime for maintenance. used the spray today on gun and mask....will be ordering more..this stuff is great. Foam overspray just wiped right off. never left the attic...just took a paper towel and a can of release with us...wipe off, re apply to mask and keep spraying..time is money and this product is a good one. You were right - it paid for itself on the 1st job. Now we don't need the shields and the Advanze goggles. This is the best stuff we have ever seen. I need a case.